After eight workshops, networking with like-minded entrepreneurs and one-to-one support, the winners of the autumn term’s Launch programme are announced. 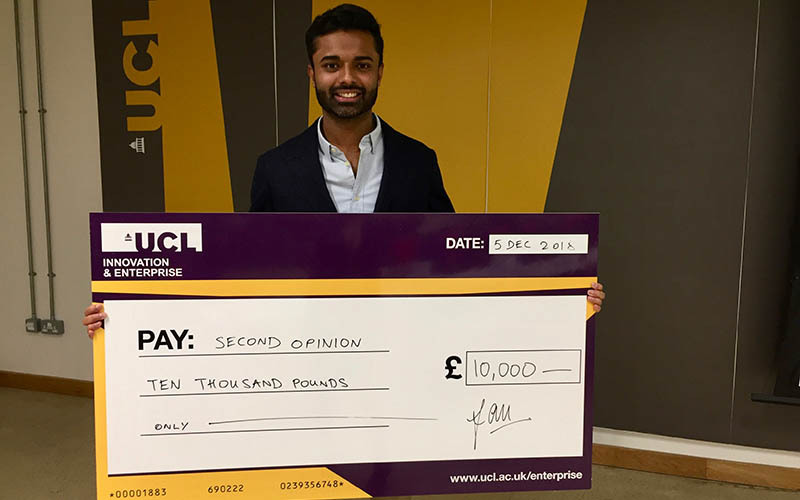 Winners of this termly competition were recently announced at UCL BaseKX – UCL’s business incubator for startups. Four prizes of up to £10,000 were awarded to UCL staff, students and alumni to help them launch their businesses. Through highly interactive workshops, the entrepreneurs refined their business plans and finalised their pitches, getting a step closer to launching their businesses. As well as laying the groundwork for a successful business, they also got to know other entrepreneurs and learn from the experts. The winning prize of £10,000 was given to Dr Vikram Palit, Clinical Teaching Fellow in Paediatric Education, UCL Institute of Child Health. His business, SecondOpinion, is an online platform for patients and GPs to access a trusted second opinion. The second prize of £5,000 was awarded to fourth year student Oskar Zieba (MEng Mechanical Engineering with Business Finance). His business, Blackwood, is a premium sustainable fashion brand, making accessories from eco-friendly materials, such as cork leather. “I’ve learnt so much about business and the knowledge I’ve obtained during the Launch programme is allowing me to take mine to a completely new level. It was fantastic being able to speak with entrepreneurial experts and receive their feedback,” says Oskar. Sioned Davies (UCL Law alumna) and co-founder Peter Hanly were given third prize and £2,500 for their business Legal Sphere. This platform connects freelance solicitors with clients in secure online space for end-to-end service delivery, leveraging the most cutting-edge technology. Dhruv Kumar (Master’s in Architecture) current postgraduate taught student and his co-founders, Minerva Zhang and Enrico Cacciapuot, received the fourth prize of £1,000 to launch their business, Rapid_Kinetic. Their business enables makers to design and build large scale robots quickly and easily. Launch £10,000 is a free termly eight-week programme run on Wednesday evenings for UCL students, staff and recent graduates. It aims to help participants clarify their business models and launch businesses in a safe learning environment, with the support of experts, business advisers and other entrepreneurs. It offers the opportunity for networking and a chance to pitch for a £10,000 prize to help develop businesses. The next series starts on 13 February and applications are open now. The deadline to apply is 9am, Monday 28 January 2019. At Innovation & Enterprise we help turn your ideas and knowledge into practical applications that benefit us all. We work with UCL staff, students and alumni to create lasting partnerships, access funding, commercialise technology, assist consultancy, support short course development and help you to think and act like an entrepreneur.